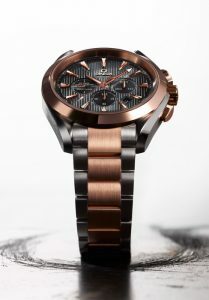 OMEGA Press Release, Thursday 25 June 2009 – Since the launch of the OMEGA Seamaster Aqua Terra collection in 2008, it has been warmly received by watch enthusiasts who have raved about its blend of eye-catching design excellence and innovating watchmaking technology. OMEGA now introduces another member of the family, the Seamaster Aqua Terra Co-Axial Chronograph. Like the rest of the collection, its trademark feature is its “Teak Concept” dial whose vertical lines are reminiscent of the wooden decks on luxury boats. The Seamaster Aqua Terra Co-Axial Chronograph’s luxury-finished movement combines OMEGA’s exclusive Co-Axial calibre 3313 and a free sprung balance for outstanding long-term performance. Its precision is confirmed by its COSC-certification as a chronometer. The self-winding watch is also equipped with a column-wheel chronograph mechanism. The Seamaster Aqua Terra Co-Axial Chronograph is available in four case materials: 18 Ct white gold, 18 Ct red gold, stainless steel or, in the bi-coloured version pictured here featuring 18 Ct red gold and stainless steel. The watches are available either with OMEGA’s patented screw-and-pin system bracelets in corresponding metals or with integrated alligator straps. The polished, brushed 44 mm case is water resistant to 150 metres (500 feet) and has a polished bezel. The matt polished screw-in crown is embossed with a polished OMEGA logo and the case features polished chronograph pushers. The Seamaster Aqua Terra Co-Axial Chronograph has a domed, scratch-resistant sapphire crystal with anti-reflective treatment on both sides, as well as a polished screw-in caseback whose sapphire crystal makes it possible to see the Co-Axial movement at work. The 18 Ct white gold model features a teak-black dial; the 18 Ct red gold and the bi-colour watches have teak-grey dials. All of them are sun brushed from the centre and have black sub-dials. The stainless steel edition is available either in vertically-brushed teak-grey with black sub-dials or in teak-ivory with silver sub-dials. The Seamaster Aqua Terra Co-Axial Chronograph has 18 Ct gold facetted central hour and minute hands coated with white Super-LumiNova and a central chronograph seconds hand. Its small seconds counter is at 9H, with the date window at 4H30. The other sub-dials are the 30-minute recorder at 3H and the 12-hour recorder at 6H. The dial has applied 18 Ct gold indexes with diamond-polished sides which are also coated with white Super-LumiNova. The OMEGA name and logo on the dial are made of diamond-brushed applied 18 Ct gold. For more than fifty years, OMEGA’s chronograph watches have been among the most respected in the world; the Seamaster Aqua Terra Co-Axial Chronograph combines this function with its popular “Teak Concept” design and innovative Co-Axial technology that could only come from OMEGA.